Simply seasoned ground meat and rice, swaddled inside tender cabbage leaves, simmered to harmonious perfection in a tangy, sweet and sour tomato sauce. We called them “glunkies” growing up, but they are more commonly known as galumpkis or golumpki, and are a favorite throughout much of of central and eastern Europe. While traditionally made with ground beef, white rice and green cabbage, I lightened up this classic by substituting ground chicken, a whole-grain blend with different rices and quinoa, and savoy cabbage…while further brightening it up with the flavors of dill and capers. Some might opt for a straight forward tomato sauce, but I love the balance brought by a more sweet and sour version. Rolled and layered dishes, while delish, are usually a pain in the cabbage, requiring lots of steps and lots of pans that will eventually need washing. In my mind, I wondered if you could use those steamer bags to pre-cook and soften the cabbage leaves, thus avoiding the massive pot of boiling water you usually need. But then I remembered recently learning that you can microwave squashes and thought that just might work with a head of cabbage too…and it does!! It also diminishes the poo-stink factor that usually makes cooking cabbage more “dirty job” than dream job. Either way, get to work and I hope you enjoy this as much as we did. Preheat the oven to 350 degrees. Coat a 13”x9” glass or ceramic pan with cooking spray. Avoid using a metal pan, as tomatoes can react with contact with some metals. Using a sharp knife, remove the core out of the cabbage and rinse well. Place the whole cabbage in a microwave safe dish and cover with very wet paper towel. Microwave about 5 minutes until the leaves are soft and separate easily from the head (remember that microwave strength vary, so realistically this step could take 4-10 minutes). Peel away a dozen or so leaves, removing the thick stem at the base of each leaf (they will be difficult to roll with this intact). Set aside. In a medium bowl, combine the crushed tomatoes, apple cider vinegar, light brown sugar, 1/2 teaspoon of kosher salt, 1/2 teaspoon pepper and water. Take about 1/2 cup or so and coat the bottom of the baking dish with a thin layer. Set the rest aside. In another medium bowl, add the 2 eggs and beat well. Then combine with the ground chicken, shallots, dill, capers, rice blend, and the remaining kosher salt and pepper. Mix well. Spoon about 1/3 cup of the meat-rice mixture in the center of each leaf, and roll as if making a burrito. Place the bundle seam-side down in the baking dish. Repeat the process until all the mixture is used. I find it makes about 12 (4 rows of 3 across). 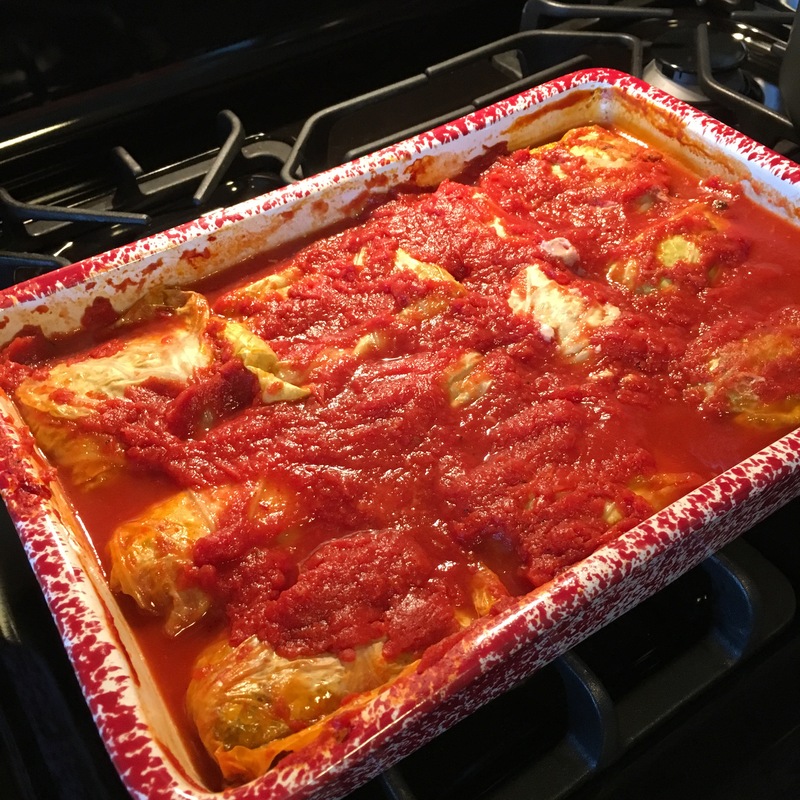 Pour the remaining tomato sauce evenly over the cabbage rolls. Cover the rolls with a 13”x9” piece of parchment paper, then tightly cover the baking dish with aluminum foil. Bake for about 50 minutes or until a meat thermometer reads 165 degree (test the inside of one of the cabbage roll from the center of the pan). Serve the rolls with a tablespoon or two tomato sauce on top of each one and nosh!